← Thank you for your support! In life we enjoy moments of inspiration which move us toward greater achievement, open our understanding and ignite a sense of being. Often these feelings define who it is we are. They come in quite moments touching our heart or uniquely enlightening our minds. We can be participating in music, art or poetry. It can come while reading, praying or through mediation. When we are inspired, it is our duty to act on our feelings. Through our expressions we teach others who too will benefit from our enlightenment. Each of us can recite times in life where our life’s course was set in a positive direction because of another. I believe the founding fathers of the United States acted on their inspiration in building the foundation of our Country. My heart was touched as I read this beautiful document the other day. This sentence is believed to be one of the best-known sentences in the English language. 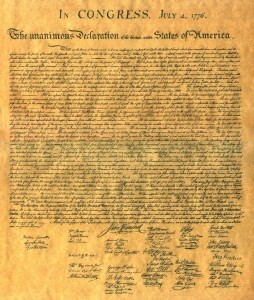 It contains perhaps the most influential words written in American history. My heart was touched as I read this document as I understood that I too can make a difference. An essay can be written about each dynamic thought expressed within this sentence. Just think, a truth will be found to be self-evident! There is equality for all no matter their lot in life! We were granted these rights at birth and they can’t be removed! How about the fact that Life, Liberty and the pursuit of Happiness are just some of our rights!? My mind centered on “the pursuit of Happiness.” I know Thomas Jefferson was influenced by John Locke’s “Life, liberty, and property,” and Samuel Adams’ “First, a right to life; Secondly, to liberty; Thirdly, to property…” I feel Jefferson wrote “the pursuit of Happiness” rather than “property” because he felt happiness included property. For me, the pursuit of happiness suggests we can develop our faculties, earn a living, increase in prosperity, operate a business and own our own land. Everyone is granted this right regardless of heritage or status. As individuals we need to be active in developing these “American Dreams” for ourselves. As citizens we need to use our talents to insure everyone who desires can participate. I am a Realtor who chooses to served my industry. Our association is dedicated to the protection of property rights, insuring business’ can operate in an free and open marketplace and the education of its practitioners. As I read “pursuit of Happiness,” I felt a moment of self-satisfaction believing my activities help guarantee the rights of others. “Under all is the land.” Ownership of land (real property) is the basis of the freedoms we enjoy in our country. It is through the proper use of our land we maintain our freedom, live happier, healthier, accumulate wealth and build social status. “Such interests impose obligations beyond those of ordinary commerce.” Real Estate as commerce plays a significant role in our society. This requires that we as practitioners act professionally and are informed in all aspects of our industry. “We can not dedicate – we can not consecrate – we can not hallow – this ground. The brave men, living and dead, who struggled here, have consecrated it, far above our poor power to add or detract. It may be that Realtors efforts go unnoticed by a majority of our population; that’s okay. It may be individuals never learn of the difference they make by using their talents, time and money insuring our country maintains this right given to all, no matter their standing in life; that’s okay too. Just believing simple things I am doing will enable others to participate in their “pursuit of happiness” is enough for me. 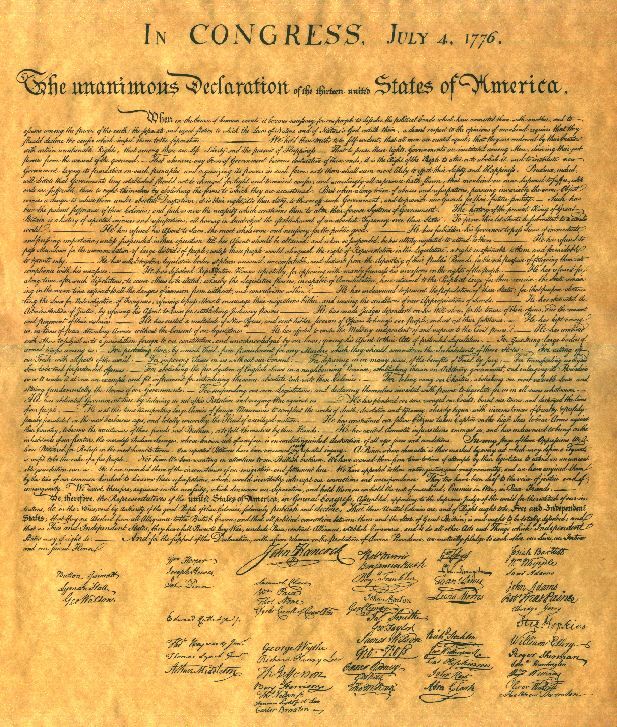 This entry was posted in Real Estate and tagged declaration of independence, impression, inspiration, property, pursuit of happiness, real estate, thomas jefferson. Bookmark the permalink.